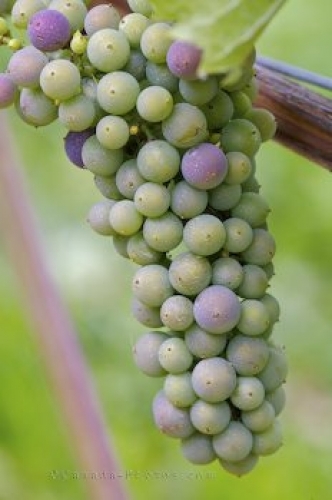 The grapes on this vine are slowly ripening in the Domaine de Grand Pre vineyard in Grand Pre in Nova Scotia, Canada. The grapes growing in bunches at the Domaine de Grand Pre vineyard in Nova Scotia, Canada are a special type of grapes which are grown to perfection for winemaking. The vine is still full of green grapes, but each one is slowly beginning to change to a purplish colour and when the entire bunch is ready, all the grapes are picked. Grapes on a vine at the Domaine de Grand Pre vineyard in Grand Pre, Evangeline Trail, Minas Basin, Bay of Fundy, Nova Scotia, Canada. Picture of grapes hanging from a vine at the Domaine de Grand Pre vineyard in Nova Scotia.